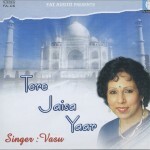 Tere Jaisa Yaar is Vasundhara’s debut album. It is a Ghazal album. (Please see Blog -> Music for a brief definition, rules and description of a Ghazal.) This album contains melodious songs with enchanting tunes, captivating rhythms and wonderful arrangements. Music was composed by Ustad Aziz Khan and Rasheed Jaipuri. Arrangements were done by Abhinav Upadhyay. The musicians were top artist in the music industry of India. Recordings were done in Mumbai and the album was released in Mumbai. Sweet Ghazal with a wonderful tune and enchanting arrangement with a mixture of modern and classic instruments. Great Tune. Amazing Arrangement. Lovely Ghazal. This attractive Ghazal depicts a loving heart longing for its beloved. Romantic tune and pleasing arrangement. A melodious Ghazal that can touch even the hardest heart. Music and arrangement are spectacular. A very popular Ghazal with a pleasing tune and a blend of classical instruments such as Sarangi, Tabla, Sitar etc. A tantalizing song that does make one's heart go crazy with enjoyment! A classic Ghazal with very strong Tabla rhythms and other musical instruments. The tune and the arrangment are captivating. A beautiful, dreamy Ghazal that makes you feel as though you are sailing in a boat.